August 20, 2012 By Bob Pilgrim & filed under All Articles, Handguns, Weapons. I am an unabashed fan of Advantage Arms (AA) sub-caliber conversion kits and have written two previous reviews on their Glock conversions for S.W.A.T. Magazine. For the money, these kits offer the most bang for the buck (pun intended) of the majority of kits currently on the market. As a result, AA kits are so popular that I had to wait months to obtain a 1911 conversion kit, because AA cannot keep up with the demand. 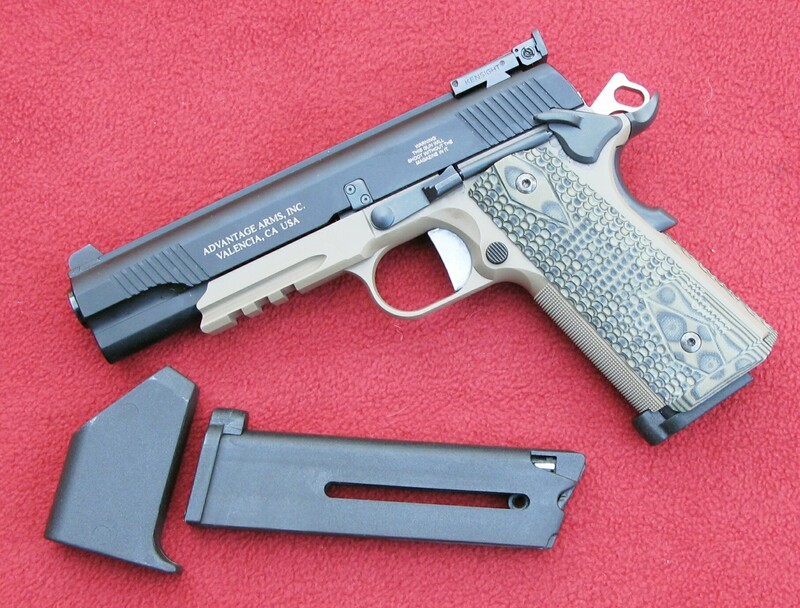 AA kit mounted on SIG Sauer 1911 Scorpion with ten-round magazine and magazine loader. Note fit and finish of slide, external extractor, adjustable rear sight, and forward slide serrations. The 1911 and 2011 Government Model kits are the latest handguns that AA has addressed, with previous focus on the ubiquitous Glock only. The 1911 kits are dedicated to single-stack pistols, while the 2011s are designed for high-capacity Para Ordnance and STI versions. When I received my 1911 Standard model sample, I immediately mounted it on the receiver of my latest acquisition, a SIG Sauer Scorpion 1911 (COMPACT STINGER: SIG Sauer 1911 Scorpion, June 2012 S.W.A.T.). In less than a minute, I was ready to burn up some rimfire loads. The red-lined padded plastic and lockable case contains the black matte finished anodized aluminum slide with fully adjustable rear Champion sight, black oxide finished 4140 heat-treated bull barrel, guide rod and recoil spring, ten-round single-stack polymer magazine, magazine loader, tools and cleaning gear, and a bottle of proprietary cleaner/lube/preservative. Its magazine has a strong spring and, while it’s not easy to load it with your fingers, it’s not impossible. 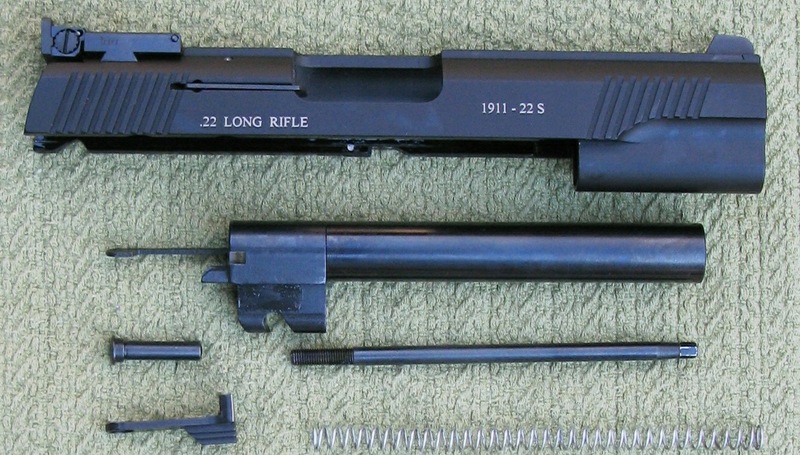 AA appreciates this idiosyncrasy, so in addition to the loader, 1911 kits come with a short and thin rod to insert into a hole below the magazine follower. The rod allows you to draw the follower down and makes loading merely a matter of dropping the rounds in. Additional ten-round magazines cost $25 each, while wide-bodied STI 2011 and Para Ordnance magazines will set you back $45. 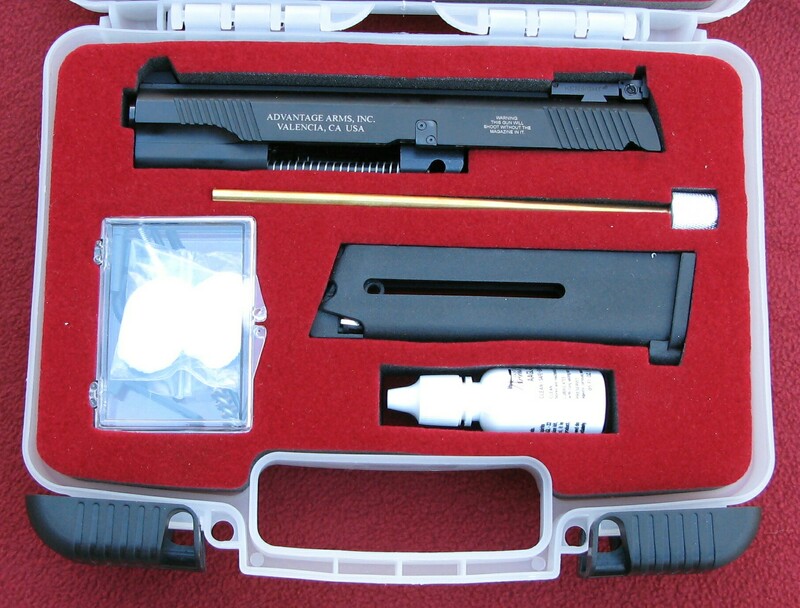 Advantage Arms 1911 Standard .22-caliber conversion kit and accessories come in fitted case. The slide weighs 13.9 ounces with all the above components plus slide stop on board. Most of the weight consists of the 6.6-ounce barrel. The magazine adds another 1.9 ounces to the package. The Scorpion with magazine weighs 41.6 ounces. 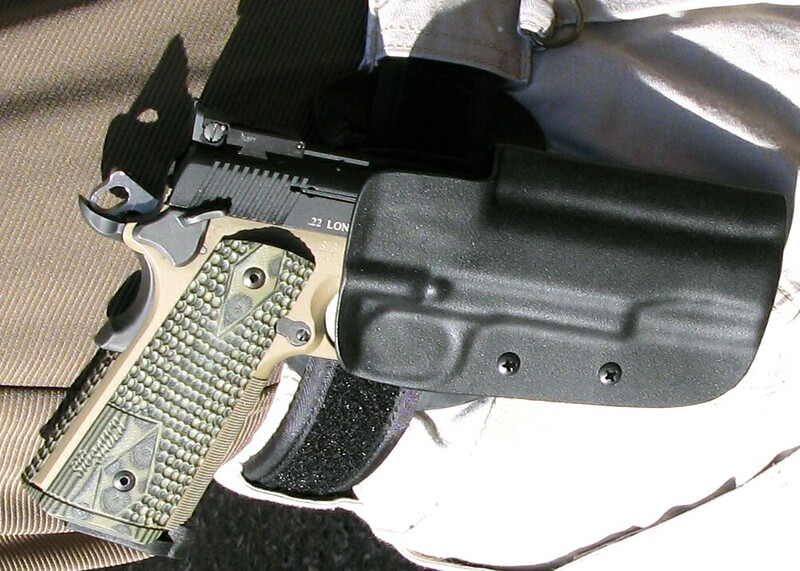 The conversion kit and its magazine reduce the weight by 7.5 ounces. Although the full-caliber pistol’s ergonomics remain the same, weight, heft and recoil will obviously not replicate that of the .45 ACP Scorpion. Nevertheless, many aspects of sub-caliber shooting are transferable to the service pistol and can be practiced at a dramatically reduced cost. The draw, presentation, reloading, other gun handling techniques, sight alignment and trigger control can all be reviewed, with the impact of the round verifying the latter two fundamentals. Reduced gun weight will not mirror recoil dwell and muzzle rise, nor will it exactly duplicate the heavier gun’s slightly slower speed of target acquisition. Think of it as a bridge between dry firing and use of full-power service ammunition. I recall that during my tenure in the FBI, we distributed match-type air rifles to field SWAT offices so our observer/snipers could continue to train on fundamentals in the field office during severe weather conditions. AA kit disassembled. Recoil guide screws through bottom of bull barrel. Small game hunting is the traditional application of .22-caliber rimfire ammunition and, based on this alone, every shooter should have at least one rifle and pistol of this persuasion in his firearms battery. When noise is an undesirable factor, the .22 in subsonic or reduced-power loadings will fill that requirement. I know of individuals who have killed deer with headshots from rifles in that caliber. Squirrel hunting with a small-bore pistol is not only challenging, but tons of inexpensive fun as well. The .22 Long Rifle, particularly when suppressed, is usually employed offensively against justifiable targets. Yet with good bullet placement and a sufficient volume of fire, the little pill can be effective as a personal-defense weapon. These guns are usually carried in reduced-threat areas and when one simply does not want to be bothered by the weight and bulk of a more serious caliber firearm. Professionally, they are at best considered “better than nothing.” Nevertheless, we are frequently reminded of the “wet” work performed by Israeli Mossad operatives and Air Marshals with not only the Long Rifle version but also down-loaded and reduced-noise “Shorts” in their tiny Berettas. Professionals in the know prescribe solids over hollow points, because with the .22, bullet penetration is more important than expansion. In addition, solids usually yaw at least once, creating a wound channel larger than their caliber. Forty-grain round-nose bullets appear to be the most reliable in these kits. A heavier bullet creates higher pressures, which result in higher slide velocities that add up to more consistent functioning. An example of the heavy bullet theory is Aquila’s SSS 60-grain subsonic round. At 700 to 800 feet per second (fps), it functions perfectly in all conversion kits that I have evaluated. AA kit fitted to SIG Scorpion and ensconced in Blade-Tech holster. The slide’s fit was quite snug when mated to the Scorpion. Its matte black finish is nicely executed and void of any internal or external tool marks or dings. The slide with steel breech has the popular fore and aft serrations and features a striated, reduced-glare rib reminiscent of the Colt Gold Cup .45 ACP. The rib also draws your eyes to the steel .015” dovetailed front sight blade when held in the high ready position. The steel Bomar-style rear sight is also dovetailed into the slide, and its sharp wings are rounded to reduce the potential for hand lacerations during immediate action drills. The sights are plain black without those near-useless and fragile colored inserts or white dots so prevalent on combat guns today. I applaud the fact that the slide locks to the rear on the last round, so speed reloading on an empty chamber can be accomplished. The barrel, with 1:14 right-hand twist, does not move during the firing cycle and contributes greatly to the kit’s accuracy. Like many conversion kits, this one has some idiosyncrasies that should be observed. Do not dry fire the AA kit. Dry firing can damage the firing pin and back of the chamber. The firing pin is designed to stop just short of the barrel, but repeated dry firing may result in the pin contacting the barrel and denting it. This could cause light strikes, feeding and extraction problems. The above is good advice with any .22 rimfire. Ammunition selection is important. AA recommends that high-velocity long rifle rounds of the 36- and 40-grain genre be used for best reliability. AA advises that, with the exception of Federal Auto Match, most Federal and PMC ammunition does not work in its kit and may result in light strikes, stovepipes, failures to feed, and misfires. 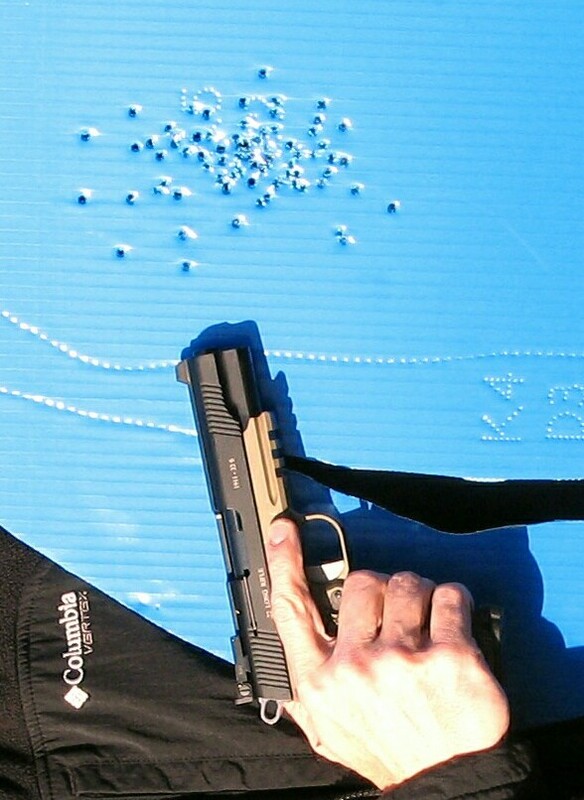 Remington’s Golden Bullet hollow point is considered the best choice for inexpensive practice shooting. But being a pessimistic contrarian, I had to see for myself. I duly loaded some Federal Champion 40-grain solids. At an average velocity of 1,134 fps, they turned in a credible 1.63” group but failed to extract and had to be hand cycled. Highest velocity with AA kit was recorded with CCI Quick Shok ammo. On the other hand, as recommended by AA, Federal Auto Match at 1,086 fps performed flawlessly. Both the Winchester SX 40-grain at 1,102 fps and its 37-grain HP brethren failed to extract and cycle the AA kit. Subsequently, AA sent me their heavier Gold recoil spring, and that solved the Winchester problem. Furthermore, some standard-velocity loads, along with Federal Lightning 40-grain ammunition, now functioned perfectly. It appears that muzzle velocity alone is not the only determining factor for reliability in this conversion kit. Ammunition burn rates differ widely, which results in varying degrees of kinetic energy or blowback impulse imparted to the slide. This is why it’s important for shooters to experiment with a variety of ammunition, so they eventually match it to their gun’s geometry. The kit likes to run slightly wet. Lubricate as indicated in the manual. Periodically check all screws and the recoil guide rod for tightness. Results of 15-yard double tap drills from holster with AA kit. In the past, I have evaluated AA’s Glock conversion kits. They are tack drivers and a little less complex than the 1911 kits. It is important to pay attention to the tightness of the recoil spring guide rod. Tightening it firmly against the slide stop not only locks the barrel to the frame but also prevents the slide stop from drifting out during firing. When my groups began to deteriorate, I noticed that the barrel had loosened up. There should be no barrel movement at all. Best accuracy of 1.15” at 25 yards was achieved with an 18-year-old box of Western SX Match ammunition. 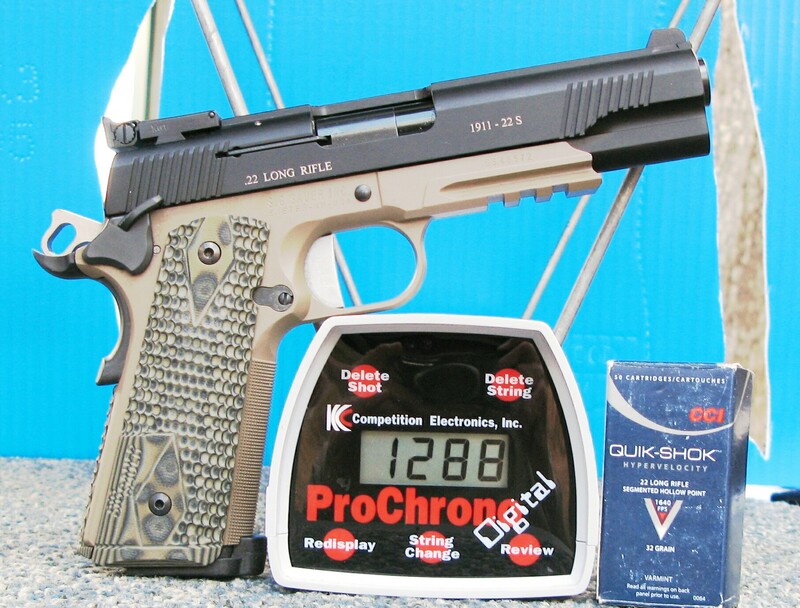 CCI Quick Shok HP turned in the highest individual velocity of 1,288 fps. When it dropped below freezing, I refired CCI Mini Mags to determine if there was any velocity change after sitting in the cold overnight. 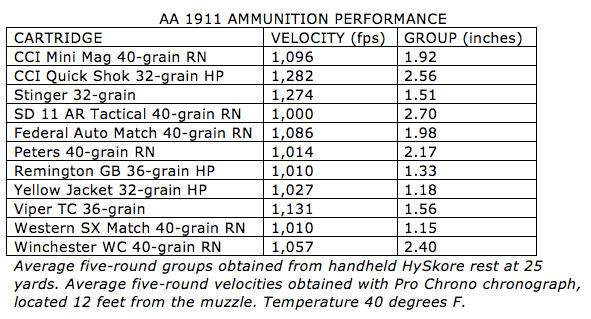 Advertised CCI rifle barrel velocity is 1,235 fps, and the shorter AA 1911 barrel lost 139 fps in a 60 degree environment. Subsequently, when puddle surface water was frozen on the range, the same round shed an additional 76 fps. When this occurred, the first Mini Mag had to be hand cycled from the AA chamber, but the next nine streamed out of the kit without hesitation. AA offers a Target model for both the 1911 and 2011 versions of the Government model. Complementing these two models is the Standard Commander kit for the 1911 only. While the Target model will set you back $350, the Standard kits can be acquired for a modest $275. Three different weight recoil springs are available to tailor the kit for its intended use. My unit initially had the lightweight spring, and as mentioned above, functioning improved when I exchanged it for the heavier recoil spring. Today there are many choices among dedicated sub-caliber firearms and conversion kits, with some kits costing as much as the complete guns. However, if you desire to own a reasonably priced kit that exudes quality, is both accurate and reliable with recommended ammunition, and enables you to continue to employ your favorite blaster’s ergonomics and trigger at a substantially reduced cost per round, do not overlook AA’s products.